Klinedinst PC is pleased to recognize Catherine M. Asuncion, who is concluding her term of service as president of the Filipino American Lawyers of San Diego (FALSD). Ms. Asuncion will continue on the board as Immediate Past President/Director at Large. SAN DIEGO, CALIFORNIA – Klinedinst is proud to recognize San Diego associate Catherine M. Asuncion, who is about to conclude her term as President of the Filipino American Lawyers of San Diego (FALSD). Asuncion’s term officially ends at the organization’s upcoming 41st Annual Dinner on January 31, 2019, and she will continue on the board as Immediate Past President/Director at Large. 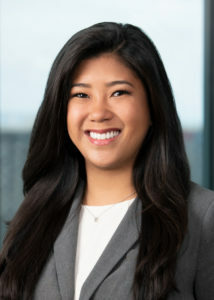 Asuncion is an associate in the firm’s San Diego office where she focuses her practice on representing attorneys in professional liability matters. Asuncion is also an active member of the firm’s Appellate Practice Group, working with trial counsel to resolve cases through pre-trial motions, appellate issue analysis, and post-trial appeals. Klinedinst will serve as sponsor of the 41st Annual Dinner where Asuncion’s term as President of FALSD will officially end. The 41st Annual Dinner is one of the most popular in the San Diego legal community, and is co-hosted by Pan Asian Lawyers of San Diego (PALSD) and Filipino American Lawyers of San Diego (FALSD). PALSD and FALSD are nonprofit organizations dedicated to advancing Asian Americans and Filipino Americans in the legal profession by preserving and fostering culture, heritage, and diversity in the Asian Pacific American community.